Lucha Libre USA returned to the Hard Rock Casino Saturday night for the first round of television tapings for a third season of the Masked Warriors TV show. This season will continue the storylines and feuds of the show’s second season that has yet to be given a definitive premiere date. Many of the trends from June’s terrific “Masked Warfare” season two finale carried over to Saturday’s show, including a pre-show “Behind The Mask” special, a season 2 commercial, and live in-ring action all projected onto the screens around the showroom. The turnout was also quite impressive - LLUSA’s recent marketing stressed the availability of inexpensive general admission seats and the showroom looked nearly, if not completely, filled. This was especially impressive considering that up to about two-thirds of the showroom appeared to be empty only a few shows ago. After a pre-show dance contest featuring luchadores Chi Chi, Mini Park and Rebecca Reyes, the announce team of Alex Abrahantes, Kevin Kelly, and Stevie Richards was introduced. Stevie acknowledged his rudo turn in joining The Right at last month’s show, and said he would be competing in-ring tonight. Also of note was the change in the luchadores’s entrance music from season 2 - the selection of songs by popular artists was replaced with what sounded like generic groove metal and hard rock. The show kicked off with Right member Petey Williams standing in the ring in front of a podium facing the hard camera. He noted the dominance of The Right (which is in possession of both the LLUSA heavyweight championship and tag team championship) and that his tag partner Jon Rekon was backstage checking the visas of all the luchastars. Williams then introduced “The Voice of The Right” Stevie Richards. Richards came down from the announce table to the ring. He explained that he had been called up by R.J. Brewer’s mother, Arizona governor Jan Brewer, to help out her son. Richards then brought out The Right’s newest member, Kip Gunn (Kip Sopp, A/K/A WWF’s “Badass” Billy Gunn). Gunn claimed he joined The Right because he was tired of all the “high-flying masked guys” stealing his spotlight. Finally, The Right’s leader and LLUSA champion R.J. Brewer was introduced. He sold fighting back tears as he described his championship victory and how proud it made his mother. He declared that The Right is strong and will be making changes around Lucha Libre USA. This lengthy segment ended with Gunn declaring that “If you ain’t down with that, we got two words for ya - Right Power.” This long promo section wisely placed the focus of season three on The Right, their dominance, and the threat they pose to the traditions of lucha libre. (1) The PR Powers (PR Flyer & San Juan Kid) beat Mascara Purpura & Diamon Face. The crowd seemed surprisingly quiet for this opening match, though it may have been because of its unfamiliarity with the two teams. The luchadores tried their hardest to win the crowd over with a variety of innovative movies. In one impressive moment, Diamon Face tagged in Purpura after performing a cartwheel right on the top ropes; Purpura then delivered a top rope 450 splash-into-arm drag to his standing opponent. The San Juan Kid finally gained the win with an impressive shooting star press with a back-first senton landing. (2) Aguila beat Anibal Jr. The announce team build up Anibal’s status as a legend in Mexico before the match. The match started out with Anibal hitting Aguila with a dive to ringside. Among other memorable spots, Aguila hit a front-flip plancha over the ringpost, and Anibal hit a gory bomb for a great near fall. Aguila gained the pinfall with a surprise roll-up. Anibal sold intense anger, even going so far as to threaten the referee. The announce team sold disbelief at Anibal’s out-of-character actions. Ring announcer Leticia Castro then interviewed former champion Lizmark Jr. at the top of the entrance ramp. Lizmark complained that he had been cheated out of his title at Masked Warfare, and that his deal with the stable Sol had gone wrong. He said that he was always a “fighting champion” willing to take on any challenger, and that Brewer should do the same and give him a title re-match. Lizmark and Leticia’s mic finally cut out; Stevie Richards claimed this was because The Right now ran LLUSA and was tired of hearing Lizmark’s nonsense. (3) Magno beat Petey Williams via DQ. Before the match, Stevie Richards humorously built up Williams by declaring him “the future best man at my wedding.” Magno was also noted as a “returning” luchador, as he had not been at LLUSA’s last few tapings. The few months off seemed to have been good to Magno, as he looked to be in great shape and brought a lot of energy to the match. This was overall a very solid match. Magno made a few great counters on Williams, including turning a hurricanrana into a powerbomb and a Canadian Destroyer attempt into a fireman’s carry to sit-out scoop slam. Magno was about to put away Williams with a top rope move when Richards stormed away from the announce table and attacked Magno for a DQ. The Right beat down Magno until Marco Corleone ran out to make the temporary save. Marco then grabbed a mic as The Right re-gathered at ringside. Brewer gave Marco one last chance to join up with The Right. Marco then cut a pretty terrific tecnico promo, explaining that, while Brewer and his cohorts judge people by their culture and their differences, he “and all decent people” judge people by their individual character. Marco said he won’t stand for disrespect towards Mexico or the traditions of lucha libre, then took a fighting stance as The Right surrounded the ring. Suddenly, Supernova and Rocky Romero appeared and joined Marco and Magno in a four-on-four brawl all the way backstage. Leticia Castro then spent some time with the audience as Stevie Richards presumably got in gear for the next match. (4) Stevie Richards beat Rocky Romero. Before the match, Rocky came out and cut an entertaining promo on Richards, channeling Razor Ramon at the end in referring to him as “chico.” Like his fellow Latin Liberators in their matches, Romero showed great energy with some explosive moves off the ropes. In following the trend of the night, this match was interrupted by Right member Petey Williams. Rocky was able to take him out with a dive to ringside, but the distraction was enough for Stevie to pull off his Steviekick for the win. Marco ran out to help Rocky but was taken out by Gunn. The three Right members stood tall over Marco and Rocky before heading up the entrance ramp. Marco and Rocky finally recovered and shared a fist pump of solidarity before leaving the ring. (5) El Oriental beat Chi Chi (with Pequeño Halloween). It seemed a rather odd choice to place Oriental - who had a pair of hard-hitting, very believable matches at June’s show - in what amounted to a comedy match, though he was quite game and played along well with Chi Chi’s great comedy routine. The two received one of the biggest pops of the nights when, locked up in a grapple, Chi Chi kissed Oriental passionately on the lips. At one point, Mini Park appeared out of nowhere and apparently turned rudo by attacking Halloween. Meanwhile, Oriental pinned Chi Chi with a roll-up. Rudo Rebecca Reyes came out and joined in on the attack on Halloween before dancing with Mini Park. This apparent rudo turn by the much beloved Mini Park seemed to really confuse the audience. (5) Marco Corleone beat Kip Gunn. Gunn started the match by blindsiding Marco as he posed on the turnbuckle; Marco came back, though, and took Gunn to the floor at ringside. Gunn then took control of the match for a long stretch. The Right once again ran out to interfere, though Marco was able to evade the attack and hit his Mark of Excellence on Gunn in the confusion. Soon, all the members of both The Right and The Latin Liberators were once again brawling, with the Liberators and Marco finally gaining control of the ring. Marco, still reeling from the attack, took a mic. He said that while he had been focusing on Lizmark, Jr. for the past several months, The Right now had his “undivided attention.” He then reintroduced the audience to luchadores in the ring- the “King of the Cuban Cutter” Rocky Romero, the “American Mexican” Magno, and the “mysterious, high flying” Supernova. The four tecnicos were then rechristened collectively as The International Alliance. This new stable posed for the crowd as the show went to intermission. After the intermission, The Right’s podium was once again set up in the ring. Brewer then spoke of the changes that, thanks to “the best lawyers in Scottsdale,” would be coming to LLUSA tonight. They included changing the name of the show to Professional Wrestling USA: American Warriors, and the banning of all masked, mini, and chica wrestlers from the company. Suddenly, a man in a suit and a red, white and blue mask resembling LLUSA’s logo came to ringside. He introduced himself as a representative of LLUSA’s commissioner’s office, and explained in a humorously soft-spoken manner that Brewer’s changes will not be taking effect; in fact, Brewer would have to defend his championship against Lizmark later in the night, while Williams would have a match with Supernova up next. (7) Supernova beat Petey Williams. This was another highly-entertaining match in the series of matches these two have had over the months, with many high-speed exchanges and big spots, including a huge top-rope hurricanrana by Supernova. Supernova would eventually gain the pin with his trademark lucha DDT. Kip Gunn then came to the ring and angrily stated that he was going to make up for his loss to Marco by destroying Magno. He then forced the ref to ring the bell and begin a 10-count to force Magno out. Magno then snuck into the ring and rolled up Gunn for an immediate win. Gunn sold complete anger as Magno slipped backstage. (8) Octagoncito & Pequeño Halloween (w/Chi Chi) beat Vladamiro & “Mini Park” (w/Chrissy Cialis and Rebecca Reyes). The recent tecnico and rudo turns by Halloween and Mini Park seemed to confuse the audience as to whom to root for; as a consequence, most of the cheers were reserved only for big moves. In the middle of the match, another mini with a Mini Park match stormed the ring and beat up the rudo Mini Park. He then ripped off the rudo’s skeleton costume, revealing another red colored skeleton costume. After this beatdown, Halloween hit a split-legged corkscrew moonsault on this fake Park for the win. The real Park continued the attack on this faker, eventually tearing his mask off (the rudo hid his face with a shirt). While it was certainly a smart move not to legitimately turn Park- he remains one of the most popular luchadores with younger fans, and his mask seems to sell very well - this bit was completely confusing and will hopefully be explained when it airs. At the announce table, the team riffed on WWE’s Raw Anonymous GM, with Abrahantes checking his iPhone and announcing, “And I quote,” that LLUSA’s next show would feature the debut of Charly Malice Jr. The original Malice has not been at LLUSA’s shows since his arrest for assaulting two police officers in Mexico in April. (9) Lizmark beat R.J. Brewer via DQ in a Lucha Libre USA Championship match (title did not change hands). Lizmark was introduced to moderate tecnico reaction which only grew stronger as the match progressed. The match was back-and-forth throughout, with a variety of big moves, including a spinebuster and spinning side slam by Lizmark. Finally, a teased superkick by Lizmark was countered into Brewer’s fireman’s carry cutter finisher. However, as Brewer went for the pin, three hooded Sol members rushed the ring. Brewer tried to fend the men off from entering the ring, until one tried to toss Lizmark his trademark cane. Brewer caught the cane and nailed Lizmark right as the referee turned to him and then signaled for the bell. R.J. fled with the belt as Sol loomed over the unconscious Lizmark. They left him lying, apparently breaking the alliance the two entities shared. Lizmark finally recovered and left the ring to a hearty tecnico response. This match ending felt a bit confused. With Brewer as the top rudo in the company, it didn’t make sense to give him tecnico sympathy by having to fend of an attack by multiple men all by himself (The Right had been banned from ringside for the match). Likewise, the Sol interference felt a bit like overkill after a show full of run-ins. Overall, though, LLUSA’s season three opening episodes (this show will make up three episodes) did a great job of progressing the main storyline that was set up at the end of season two. As the main focus of the night, The Right continued to look like viable top rudos and earned tremendous heat all night. The formation of The International Alliance, meanwhile, offers The Right a great top opposition made up of tecnicos that can work great matches and are extremely over with the Albuquerque crowd. The apparent tecnico turn of Lizmark Jr. was also very believable; it looks like it will lead to an upper mid-card feud between Lizmark and his Treachery stablemates and a Tinieblas Jr.-led Sol faction. 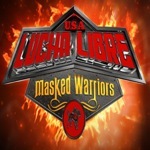 With solid matches, a total lack of technical problems, and the largest live turnout since its Albuquerque debut in December, Lucha Libre USA looks very strong going into Masked Warriors’s third season. Questions or comments? Send me a tweet at twitter.com/roqnrollmartian!